Firstly, I can't believe Tom Petty is 58 this year! I find it strange that so many rockers still rocking are well into their 50s and 60s. In my mind, their voices sound young, so they must also be. I didn't have too much rock and toll where I grew up, let alone television, so I never saw Tom Petty and the Heartbreakers perform. I saw only the odd photo or album here and there. However, a few of my all-time favorite songs happen to be from this man and his band: Refugee, Don't Come Around Here No More, and Free Fallin'. In this stunning book I learned Mr. Petty was born and raised in Gainesville, Florida, and formed a band in his teens. 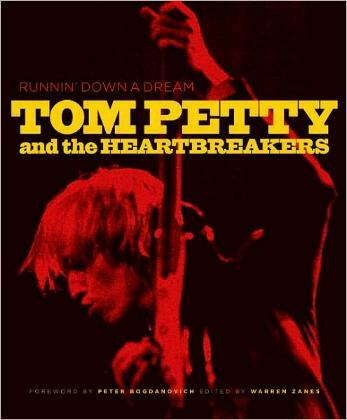 This book is a look at not only Tom Petty and the friends who were in his band, but there are comments from other artists, a look at how he got into music, how he got inducted into the Rock and Roll Hall of Fame, and a whole lot more. Nothing too personal however. There are old pictures, new pictures, scribblings, business cards, magazine covers, album covers, records, newspaper articles, and more. I love how the book is made up of quotes from Petty and others - my kind of book! Like most, Petty's surroundings and upbringing sculpted him so that he became the artist, poet, songwriter, performer, and musician he is today. Not everyone has it in them to capitalize on their particular situation, but I'm very glad Tom did. I'm also glad he joined the Traveling Wilburys - I loved their music. Fantastic photographs, old and new, arty and edgy. This book coincides with the Peter Bogdanovich documentary film on Petty and the band, and is a wonderful insight into one of the world's best bands. Visit the Tom Petty website. Conclusion - More than a coffee table book - this huge book is definitely a collector's item. Fab. Fab. Fab.